We love filming our couples, but every once in a while we get the chance to film a friend’s wedding. We have been friends with Kathleen’s parents since our early years of marriage. In fact, they were and have continued to be mentors to us about how to make a marriage thrive. As the years have gone by we’ve also had the privilege to become friends with their kids (who are no longer kids!). Kathleen and Nathan’s Wedding Film from For Real Wedding Films on Vimeo. Kathleen and Nathan’s ceremony at the “oil can” church in University Circle was as close to a cathedral as you can get in Ohio. It was thrilling to see rose petals falling from the dome as they recessed down the aisle. From there we got to fight the elements at East 4th Street, accompanied by laughter and broken umbrellas! We also get some beautiful shots at the gorgeous Palace Theater. We ended off the night partying at Carrie Cerino’s, the place where Kathleen’s parents went on their first date (and, incidentally, we had our rehearsal dinner back in 1998!). All in all, we not only loved spending the day capturing Kathleen and Nathan’s wedding, but we also believe wholeheartedly in their marriage. We’re having fun working on Kathleen & Nathan’s wedding film! Here’s a little teaser! Kathleen & Nathan Teaser 2! from For Real Wedding Films on Vimeo. Lindsay & Patrick’s wedding day was simply elegant. They got ready for their grand day in the 1890 Arcade. We then went to the historically beautiful Cathedral of Saint John the Evangelist in downtown Cleveland. From there we traveled around to various segments of the city including iconic bridges and trendy wall art. Finally, we ended the night in the stylish Ariel International. Housed in a refurbished historical former garment factory, Ariel International takes class to a new level as guests danced, cried, and laughed, all with a stunning view of Cleveland’s skyline and Lake Erie. Enjoy! Lindsay & Patrick’s Wedding Highlight! from For Real Wedding Films on Vimeo. Lindsay & Patrick's Wedding Film from For Real Wedding Films on Vimeo. Alexa and Brad went to a friend’s wedding where every part of the day, from getting ready to the ceremony to the reception, was at the same location. After that wedding they decided that was exactly what they wanted too! Then they discovered the Union Club. Built in 1905, the home of the Union Club is a stately building with ornate woodwork, grand staircases, and elegant ballrooms. Not only was the building gorgeous for video opps, but Playhouse Square was simply a short stroll down the road for more lovely locations to capture Alexa and Brad’s fun and passionate spirits. Some of our favorite parts of the day were using the great natural light streaming in through the windows to capture both Alexa and Brad individually as they got ready for the ceremony and also seeing how much they just delighted in one another especially during their first dance. Enjoy! Alexa & Brad’s Wedding Film from For Real Wedding Films on Vimeo. Alexa & Brad’s Wedding Highlight! from For Real Wedding Films on Vimeo. Just wanted to send along another little teaser before Alexa & Brad come to see the full film next week! Alexa & Brad Teaser 2 from For Real Wedding Films on Vimeo. Alexa & Brad’s Teaser film! Alexa and Brad Teaser! from For Real Wedding Films on Vimeo. Enjoy a little peek into Kathleen and Nathan’s wedding! Here’s a fun little iPhone video we shot at Nathan and Kathleen’s wedding in downtown Cleveland. Enjoy! Cait & Matt’s Wedding Film! How many ways can you say: Wow? Beth and I said it throughout the day of Cait and Matt’s wedding, we said it while editing the footage, and we keep saying it each time we watch the final film. This was a gorgeous wedding. Our favorite part was all the time they had built into the schedule to just ‘play.’ After their first look we and their wonderful photographers Nick & Danee just had fun posing Cait and Matt and having them do all sorts of beautiful and fun things throughout the lush Hillbrook grounds. We especially appreciated Cait’s enjoyment of letting us try all sorts of fun creative shots that ended up adding so many precious details to their film. Thank you again, Cait and Matt, for the opportunity to share and capture your day. We honestly delighted in the whole process of your wedding! Cait & Matt’s Wedding Highlight from For Real Wedding Films on Vimeo. Here is the full version. It’s also example of our newly created Mia Rose package. Cait & Matt’s Wedding Film from For Real Wedding Films on Vimeo. It’s not often you get to film the wedding of a radio talk show personality! 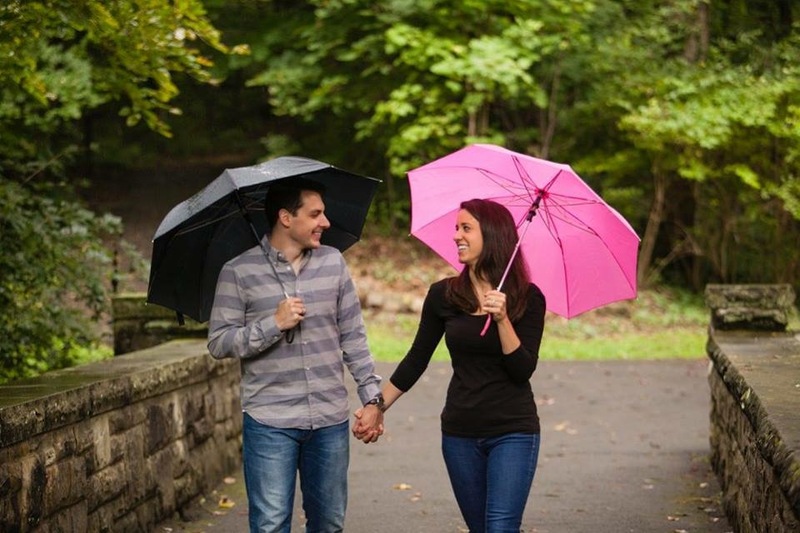 Kathleen Ferrini is marrying Nathan Zion this Saturday and we are thrilled to be a part of capturing that day. Kathleen does the morning show, “Brian and Kathleen Mornings” on WCRF. We had Kathleen and Nate over last week and it was so great to meet them. It is lovely to meet a couple where love, faith, values, and fun are all mixed together. That’s a recipe for joy that makes us excited not just to film their wedding day, but also to see how their marriage will be a blessing to others.